Happy Wednesday, friends! I have a fun guest post for you today! I have invited Brittany Anas from ShopAtHome to talk about how to look like a million bucks at the office without breaking the bank! You all know that I love to shop, but you also know that I love to shop smart. I don't like to pay full price, so I am always on the look out for ways to save. The problem is, I just don't have a lot of time to dig for deals. I am excited to have Brittany here today to share her tips! I hope you enjoy! When I first started working for a daily newspaper, I asked an editor about the “office dress code.” The response? “Um, try to dress a little bit better than that guy.” That guy was the sports editor. Who was wearing flip-flops, a tank top and faded cargo shorts. Where were the fedoras? The guys wearing suspenders? My Hollywood-ized idea of what a newsroom looked like totally fell flat. You can definitely tell the difference between the newspaper reporters and the broadcast news reporters at the scene of any story. Seriously, while waiting around for a news conference once, I asked a broadcast news guy how he got his foundation to blend so nicely with his neckline. But no matter where you work – and even if the dress code is lax – it’s best to look like a polished professional and put your best face – and style – forward. (Read: More like broadcast, less like newsroom). As a higher education reporter, I keep my closet divided into two sections: outfits and shoes comfy enough to walk around campus in and that – hopefully – won’t get me called “ma’am” and more conservative dresses and suits that can take me to budget meetings, the state Capitol and the courthouse. Here’s a few ways you can look like a million bucks at work – without blowing your whole paycheck on your wardrobe. When you use ShopAtHome.com, you’ll get Cash Back on your online purchases at your favorite stores – and who doesn’t like an extra paycheck every now and then? Some rules still apply. No flip-flops, no letting your bra straps play peek-a-boo, no dressing like a sports editor. This fall, women’s shoes are borrowing styles from the boys, with masculine plaids juxtaposed with more feminine patent leather. I’m also spotting quilted patterns on everything from purses to pencil skirt pockets. (I found a white and black version from The Limited for $69.90 – plus Cash Back from ShopAtHome.com). Some of my fave stores for work clothes – The Limited, Ann Taylor and Banana Republic – often hold flash sales, discounting full-price apparel by up to 50 percent, but for a limited time only. When you install the ShopAtHome.com toolbar, you’ll be alerted to the sales, which you can couple with additional Cash Back. I also am loving a good, classic satchel for fall and found one that’s on sale for $29 at Dorothy Perkins. The black stone earrings (which could add a lil’ edge to any outfit) are on sale at Pink Mascara, a fun boutique that will give you 15 percent off your first purchase in exchange for your e-mail address, and where you can earn another 5 percent Cash Back from ShopAtHome.com. To make your more conservative suits and dresses feel “in the moment,” invest in classic and neutral pieces and update them every year with more affordable accessories. I shopped Banana Republic and Ann Taylor (both stores that offer Cash Back at ShopAtHome.com) to find some fall accessories that will add an instant update to your dresses. Cardigans and new hosiery are also a great way to give an affordable boost to your work wardrobe. The runways have been showing shades of green – and I love this hunter green satchel from Banana Republic. This scarf in neutral colors can add interest to a blazer and button-up combo or be tied to a purse to pop some pattern into your outfit. 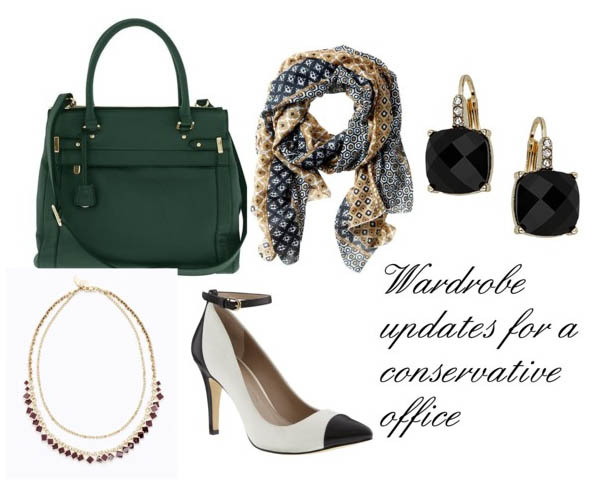 For offices with stricter dress codes, I like close-toed shoes and more delicate jewelry – like the deco-inspired necklace from Ann Taylor. She had me at "cash back." Who doesn't love that? I am always looking for inspiration to update my work wardrobe, and I am loving Brittany's picks for fall. I will definitely be doing some shopping with ShopAtHome! What about you? Shop our favorite stores, save money and earn cash back? No brainer for us budget fashionistas! 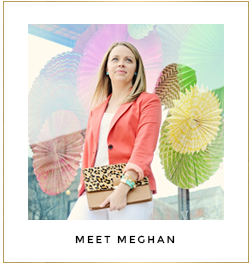 Thanks, Brittany, for sharing your tips with Everyday Fashion and Finance!